Sri Lanka has one of the highest literacy rates in the Asian continent. The country's firm economic growth, rising population as well as government initiatives such as Education Reform Program are expected to drive the education sector in a positive direction over the coming years. Further, projects such as Accelerating Higher Education Expansion and Development Operation (AHEAD) project would result in the growth of the stationery market during the forecast period. In paper stationery, exercise notebooks hold the largest market revenue and volume shares by type while in the non-paper stationery segment, pen and pencil segments account for the highest revenue and volume shares in the overall Sri Lanka stationery market. Under the Education Reform Program, Sri Lankan government would further increase the public spending for education sector as a share of GDP from 1.7% to 6% by 2023, which would further drive the stationery market to upsurge over the coming years. The report comprehensively covers the Sri Lanka Stationery Market by types, applications and regions. The report provides an unbiased and detailed analysis of the on-going trends, opportunities/high growth areas and market drivers which would help the stakeholders to devise and align their market strategies according to the current and future market dynamics. •	Historical & Forecast data of Sri Lanka Stationery Market Revenues for the period 2014-2024F. 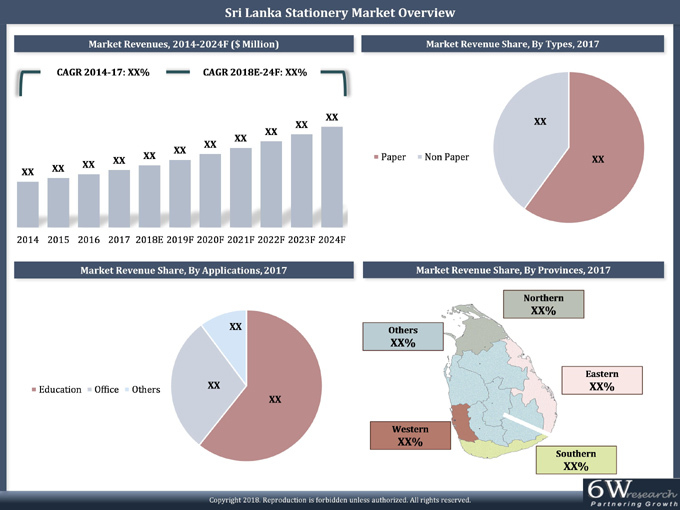 •	Historical & Forecast data of the Sri Lanka Paper Stationery Market Revenues for the period 2014-2024F. •	Historical & Forecast data of the Sri Lanka Copier Paper Market Revenues & Volume for the period 2014-2024F. •	Historical & Forecast data of the Sri Lanka Exercise Notebook Market Revenues & Volume for the period 2014-2024F. •	Historical & Forecast data of the Sri Lanka Notebook Market Revenues & Volume for the period 2014-2024F. •	Historical & Forecast data of the Sri Lanka Diary Market Revenues & Volume for the period 2014-2024F. •	Market Drivers, Restraints, Trends and Developments. •	Player Market Share and Competitive Landscape. 14.5 Hindustan Pencils Pvt. Ltd.
14.6 Linc Pen & Plastics Ltd.